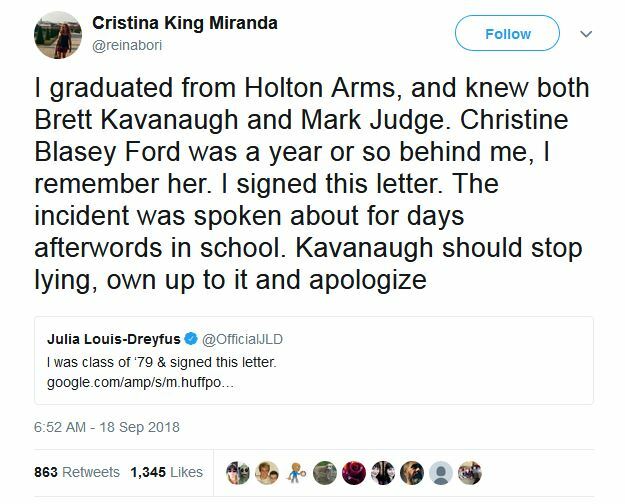 On Tuesday, a woman identifying herself as one Cristina King Miranda claimed on Twitter that she knew both Judge Brett Kavanaugh and Mark Judge, two individuals named in an allegation of sexual misconduct by Dr. Christine Blasey Ford. “I graduated from Holton Arms, and knew both Brett Kavanaugh and Mark Judge. Christine Blasey Ford was a year or so behind me, I remember her. I signed this letter. The incident was spoken about for days afterwords in school. Kavanaugh should stop lying, own up to it and apologize,” she said. But, Twitchy said, this claim certainly doesn’t fit with what Ford herself alleges. As you may recall, Ford claims she never spoke of the incident until sometime about 2012. Was Ford lying or is this person lying? No, it doesn’t. But as we’ve seen in recent days, it seems that neither facts nor logic matter.